The weather is supposed to get slightly warmer next week but don’t put away the heavy jacket yet. Shortly after sunrise on Groundhog Day Feb. 2, 2017, Woodstock Willie saw his shadow and decided to return to his abode until spring comes. So at least Midwesterners should be prepared for six more weeks of chilling winter. On the bright side, folks can visit Woodstock, IL where the movie, “Groundhog Day” was shot. They can see the movie for free and tour the sites in the movie now through Feb. 5. (The Woodstock site is down this morning, Feb. 2 but try it later). This year marks the 25th anniversary of the filming. Next year the town celebrates the 25th anniversary of the film’s release in 1993. Also starring Andie MacDowell as news producer Rita Hanson and Chris Elliott as cameraman Larry, the “Groundhog Day” supposedly takes place in Punxsutawney, Pennsylvania. However, with the exception of a couple of opening and highway shots to set a sense of place, it really was filmed in the cute, countryside town of Woodstock, IL Ramis had been searching for a site within a day’s drive of his Winnetka home. Unfortunately for easterners. 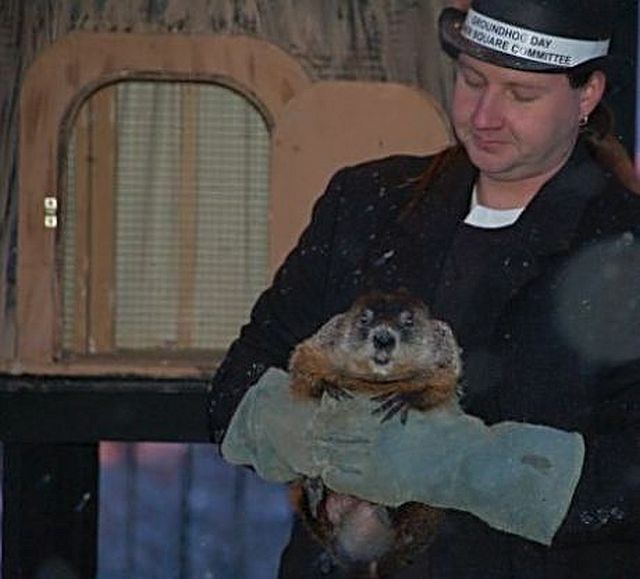 Punxsutawney Phil also saw his shadow in Pennsylvania so it looks like Spring is not on the way. The groundhog prediction legend emigrated from Europe where farmers thought spring was coming if they saw badgers.